When it’s time to sell a portion or your entire collection of silver coins, you undoubtedly want to get the best price possible. The coin collecting community as a whole uses a series of time-tested methods, but the first and most important step is knowing what you have and what it’s worth. Unfortunately, too many people overvalue the majority of their collection and undervalue the truly rare coins. When you know the value of your coins, you’re in a much better position to recognize a reasonable offer when you sell silver coins to a dealer. Separating Your Collection The first step is sorting your collection to separate the numismatic or collectible coins, which should be valued individually and separately from your bullion coins. 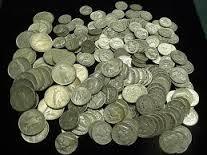 This includes silver coins with valuable mint marks, rare dates and those in high end condition. Evaluate each coin to determine which have collectible value and be sure that special care and attention are paid to these coins during the coin appraisal process. US dimes, quarters and half dollars minted prior to 1916, if not degraded or heavily worn, oftentimes carry a premium over their silver value; even in circulated condition. Silver coins minted between 1916 and 1940 have a good mix of common and rare dates, so you will need to check the mintmark, date and condition of each. A good example is the Standing Liberty quarter minted from 1916 to 1930; many of which are valued at prices above their silver content. With the exception of a few examples, Washington quarters, Franklin halves and silver Roosevelt dimes are considered common date coins, which are occasionally referred to as junk silver coins in the industry. However, even common date coins in uncirculated condition can sell at a slight premium over their silver value. Any coin types that are known to contain key date coins should be closely scrutinized. Because it’s easy to overlook a rare coin, refer to leading coin resources and price guides for each series. Demand. Even fairly high mintage coins can demand a premium if they’re popular among coin collectors or numismatists. Condition. Sometimes very small differences in the coin’s grade can make a huge difference in value, but not always. For example, a 1926-s Standing Liberty quarter may sell for $3 in good condition but $650 in uncirculated condition, and possibly even more in choice uncirculated condition. Scarcity. Typically speaking, the rarer the coin, the higher its value. To determine a coin’s value before you sell silver coins, start by identifying the coin. Then estimate its grade, check for a mint mark and research the value of the coin. Be sure to have realistic expectations, as retail prices are rarely paid by coin dealers. Once the collectible coins are individually valued, you can determine the value of the rest of your collection primarily by calculating its silver value. You can use a silver coin value calculator for this by selecting the U.S. coin, entering the quantity and receiving the current silver price. If the calculator doesn’t have the coin available, or you’re unable to find a reliable calculator, you can look up the coin’s weight and purity to determine its silver value. For example, a Barber Dime 1892-1916) is 90% silver and weighs 2.5 grams. This means that its actual silver weight (ASW) is 0.07238 ounces. To determine the coin’s actual silver value, multiply the ASW by the spot price for silver. If you need to calculate the ASW of a coin, take the weight in grams, multiply by the fineness of the coin (e.g. 90%) and divide this figure by the total number of grams in a troy ounce (31.1034768). With this information, you should have no trouble sorting through your collection to spot rare or collectible coins. You can then calculate the silver value of the remainder of your coins. While it’s a time-consuming process, following these steps will prevent you from overlooking a rare coin that may be worth substantially more than the coin’s silver value.